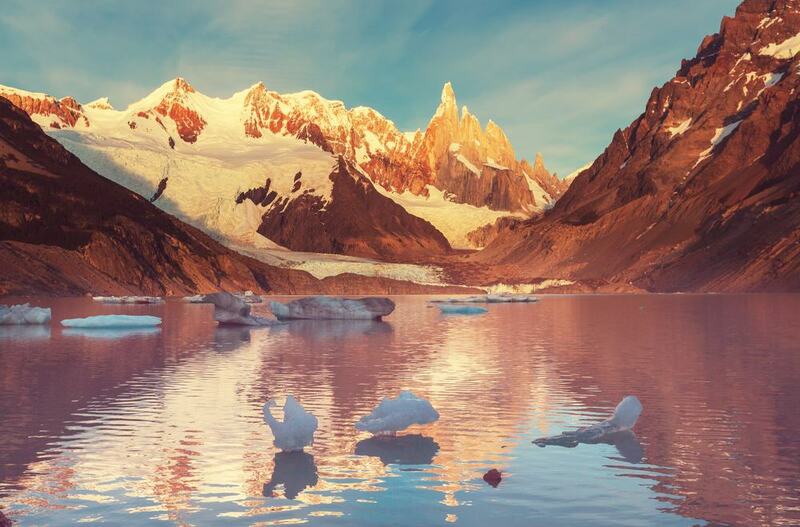 The trekking capital of Argentina, El Chaltén means “smoking mountain.” Located right near Argentina’s border with Chile in the heart of Los Glaciares National Park, the landscape around this town is rugged, dramatic, and impressive. Catering to a guestlist of trekkers and backpackers, there are plenty of trails, outdoor activities, and hostels here. There’s even a National Trekking Festival here in March when all sorts of outdoorsy people flock to town. The weather is unpredictable, so make sure to give yourself at least a few days here to take in all the famous mountain view. The population of El Chaltén is less than 2,000, but it can increase to 20 times that when high season (November to February) rolls around and trekkers flood the town. This spectacle of a mountain is one of the main reasons that El Chaltén exists as a tourist town, and so it’s one of the most popular hikes. 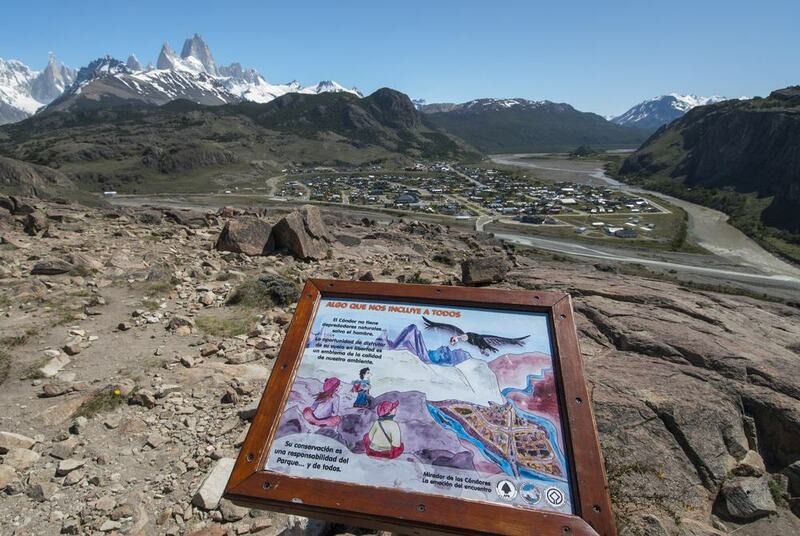 Visitors flock to this little village to arrange trekking trips out to Mount Fitz Roy and its scenic lakes and viewpoints. The hike can be done in a day, and the trails are clearly marked, though you may want to wait for clear weather so that you can actually see the mountain and take great photos. Some trekkers choose to spend the night along the route, as the last mile uphill can be a bit steep and occasionally icy. Sites along the trail include Antarctic beech trees, the Del Salto stream, and Lagunas Madre and Hija. 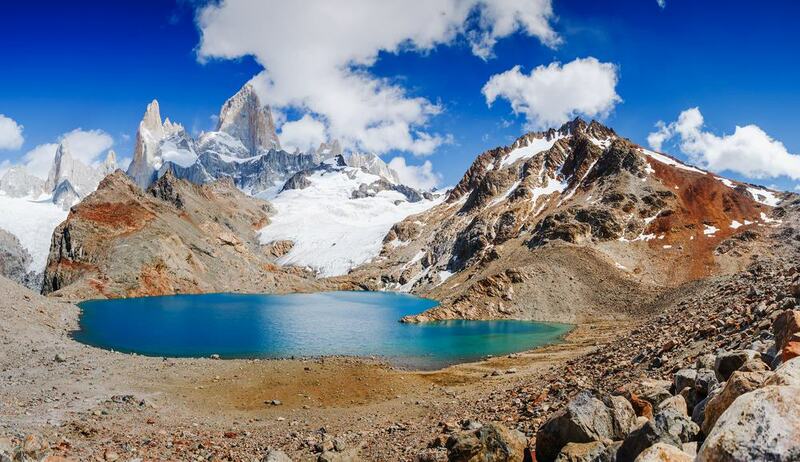 Keep going until you reach the brilliant blue Laguna de los Tres for spectacular views of Fitz Roy (ie, the reason you do this hike). Fun fact: the profile of this mountain inspired the logo for the outerwear brand Patagonia. Another one of the most popular treks out of El Chaltén, hikers can also make the trek to the steep and dramatic Cerro Torre mountain in a day. The trek isn’t too terribly difficult and you’ll see beautiful scenery along the way, like streams, forests, the Cordón Adela range of mountains, and even small icebergs in the lakes fed by glaciers. Trails are well-marked, but you can arrange for a guide if you want to learn more about the flora and fauna. Near Laguna Torre there’s the De Agostini Base Camp where you can camp for the night, but the whole trek can be done roundtrip in 9 hours. If you’re feeling really ambitious and need to check off all the big trekking sites in one day, there are side-trails from Laguna Torre that can be combined into a loop to visit Laguna de los Tres and Fitz Roy as well. A hidden gem outside of El Chaltén, you’ll need to make your way down a bumpy road about an hour away to Lago del Desierto to begin the hike (there are shuttles). 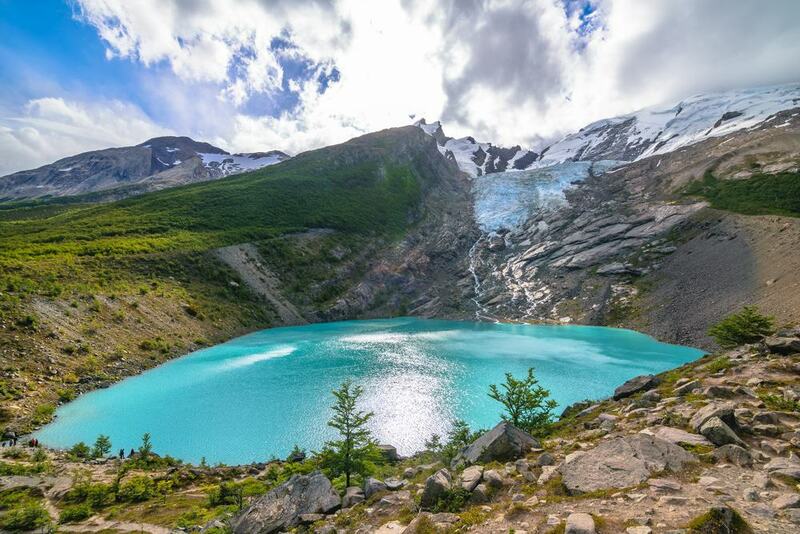 A pretty easy and flat route, you’ll hike through magical, mossy forest scenery filled with streams and waterfalls on the way to the glacier. The trek ends at a pristine lagoon with the hanging Glacier Huemul above it where it’s possible to see condors and a unique view of Mount Fitz Roy. You have to pay an entry fee, as the trek crosses private land, but it’s one of the less crowded hikes in the area. To get a better look at the Viedma Glacier and those brilliantly blue chunks of ice floating on the water, plan a boat trip out onto Lago Viedma. You’ll leave on a high speed catamaran, setting sail on the turquoise waters fed by the glacier to get a little closer to the source. You’ll see a few icebergs floating around as you snap some photos of the glacier itself, and you might catch a few condors circling overhead as well. 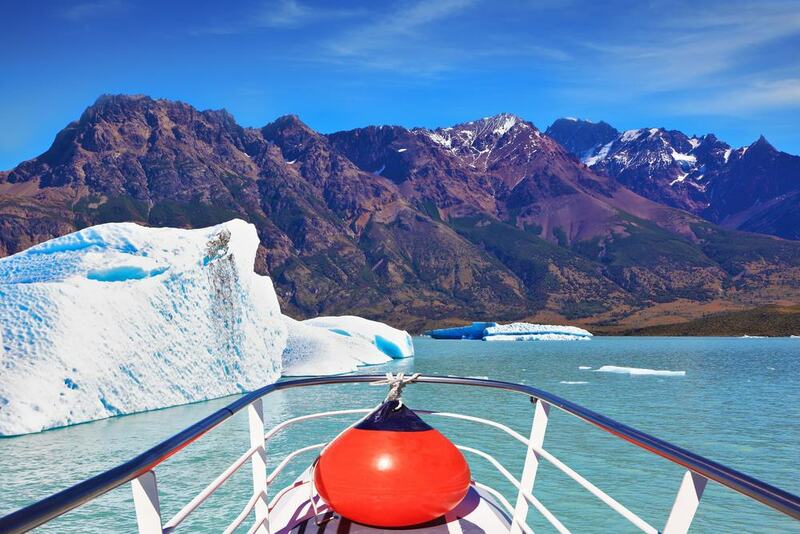 Just a short ride from El Chaltén, tour companies can arrange these boat rides along with a few snacks onboard. From the lake, it’s not quite as impressive as the famous Perito Moreno Glacier, but it’s worth a day trip. If you like you can combine it with ice trekking and have the boat drop you off at the glacier – it’s only accessible by boat! 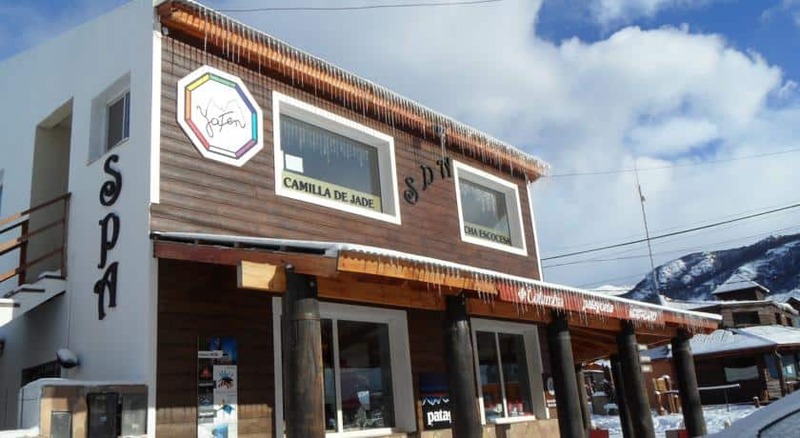 Just like there’s après-ski in all those ski towns, there’s après-trekking (albeit on a smaller scale) in El Chaltén. 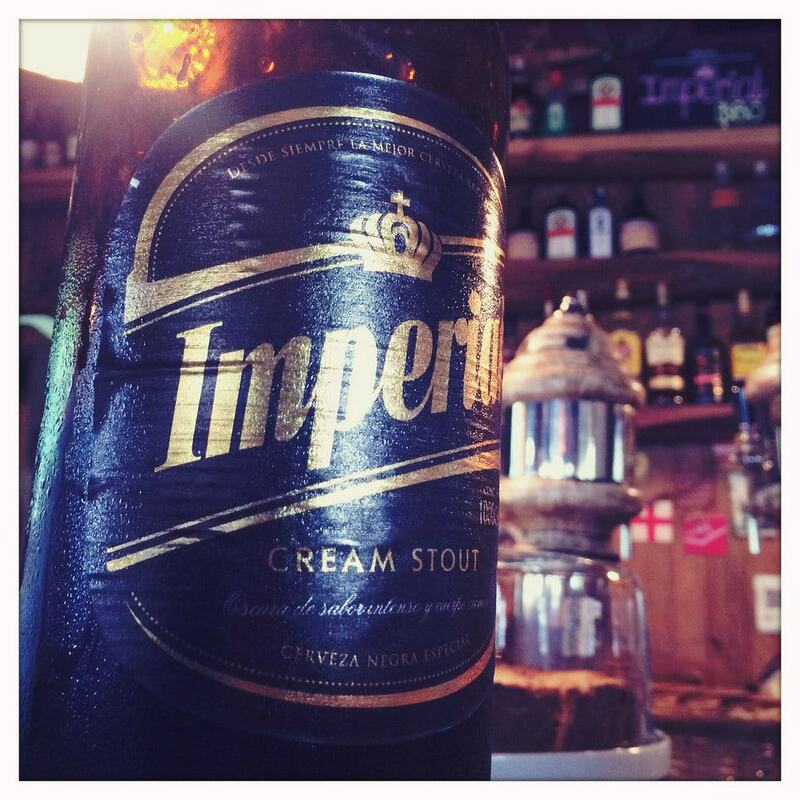 La Cerveceria is a popular place to relax with a locally brewed beer after a hard day of trekking. This rustic, cozy brewpub is all about the cervezas artesanales, and they give customers free popcorn with their beers. It’s a microbrewery and a beer garden where you can sit outside, listen to music, and make some new friends – a high likelihood in this town filled with hostels of outgoing backpackers. La Cerveceria also serves great empanadas, locro (a regional stew of meat, corn, and potatoes), pizzas, and pastas, so you can try a little traditional Argentine fare while you’re here too. 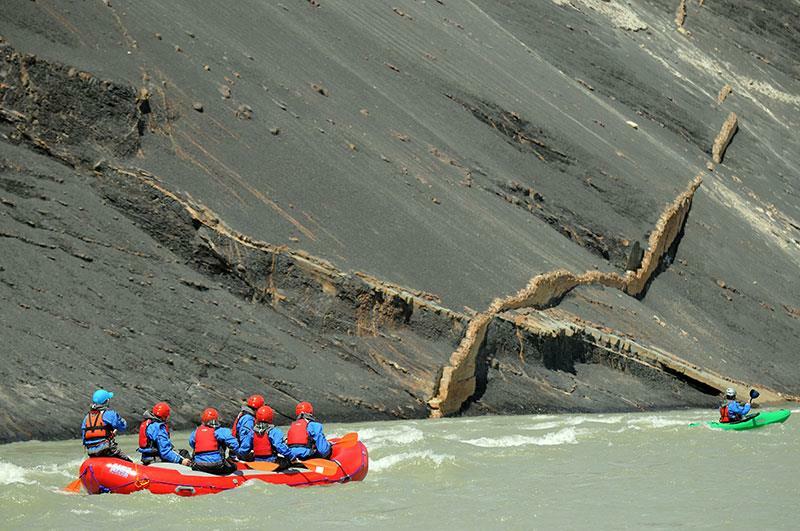 If you’ve ever wanted to go white water rafting on glacial tributaries, El Chaltén gives you the chance to do it. Rafting is a great way to rest your legs after trekking while still exploring the gorgeous mountain scenery and getting your daily dose of adrenaline. Tour companies will take you out on El Río de las Vueltas or the “Lake Desert” to experience class III and IV rapids with Fitz Roy as your backdrop, so things can get pretty exhilarating! You’ll be provided with dry suits, helmets, life jackets, neoprene boots, and professional guides – and maybe even a photographer who’ll capture your afternoon racing down the river. Just a few minutes from town and a popular hiking destination, it only takes a little over an hour (round trip) to reach this natural waterfall, Salto El Chorrillo. Along the way you’ll encounter wildflowers, woodlands, and air that gets more humid as you approach the falls. It’s an easy and popular hike if you’ve already worn yourself out on the bigger treks around El Chaltén, and the lake makes a great place for a picnic. 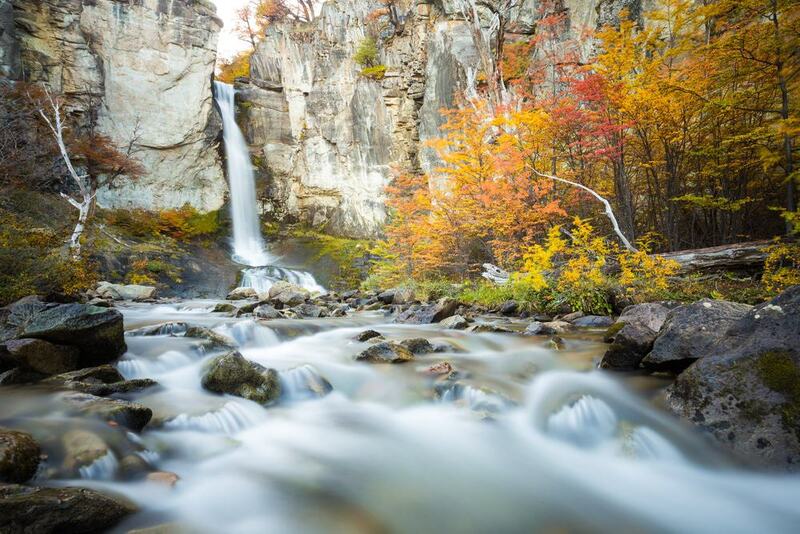 Rumor has it that the water is drinkable and many fun-loving hikers even jump in for a swim. Another easy hike, but perfect for when you want to get out of the city for some views, the Miradores Los Cóndores and Las Águilas are great for a half-day adventure or a warm-up trek. This hike takes you through meadows and forests to Lago Viedma where you can overlook the glacier and – as the names of the viewpoints suggest in Spanish – look for eagles and condors soaring overhead. It’s a nice trail for those who aren’t up for Fitz Roy or Torre as it’s relatively short and you can choose to go to either one or two of the miradores. You’ll have views of the mountains and the town, but lots of hikers luck out and see wild armadillos along this route too! Arrange to do a different kind of trekking by strapping on some crampons and hiking on the ice of a huge glacier. There are tour companies in El Chaltén with all the gear and tools you’ll need, and they’ll take you out to Lago Viedma to begin your journey. 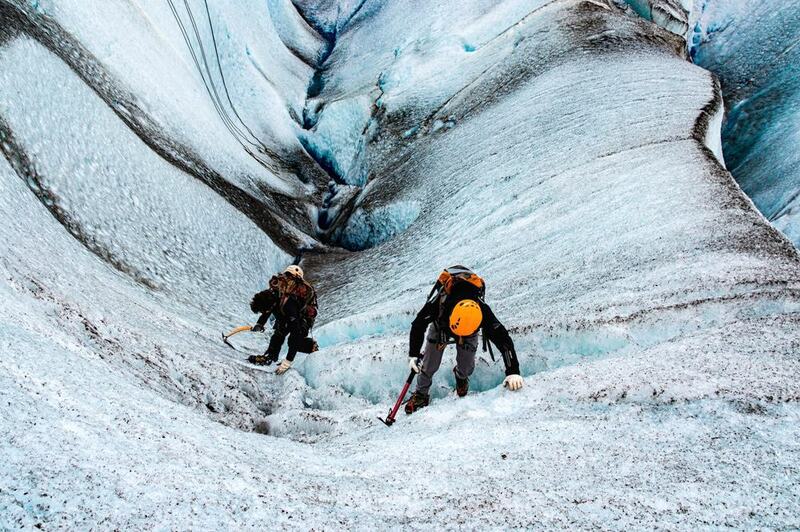 You’ll get lowered into the icy blue crevasses to climb back out again, and guides are happy to help beginners learn. Viedma is much less touristed (and cheaper) for trekking than the popular Perito Moreno Glacier, even though it’s actually the biggest glacier in the country at 380 square miles. The ice of the Viedma Glacier is over 40 meters thick and you’ll be able to listen to it crack and break in dramatic fashion during your visit. A bit further from town than most attractions, some visitors choose to explore the petrified forest from their base in Calafate as it’s located halfway between these two popular Patagonian towns. Just off of Ruta 40 on a private estancia (ranch) you’ll find dinosaur fossils, rock formations, and petrified trees amidst a lunar landscape. 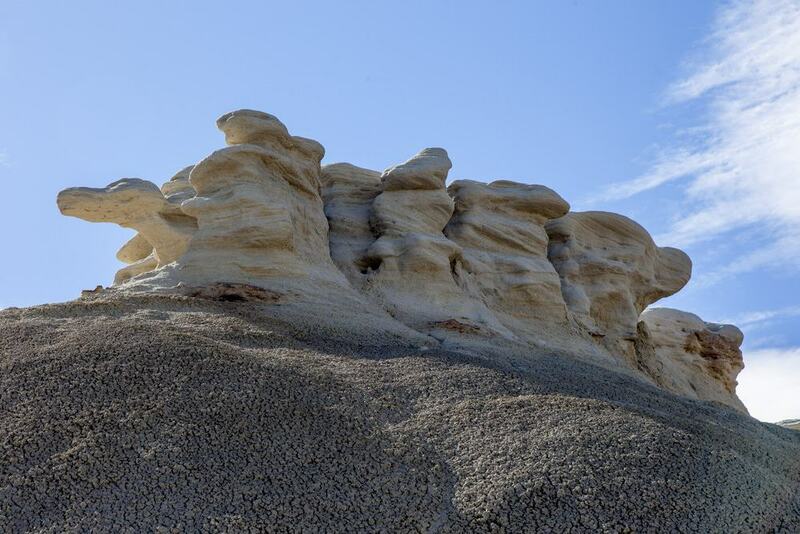 Arrange a guided tour and take the easy 7 mile (12 km) hike through the area, learning about the forests, volcanoes, and dinosaurs that once flourished here in this now desert-like expanse of land. You’ll hear all about the geology and paleontology of the area, and some tours even throw in a stop at the historic Hotel La Leona where Butch Cassidy and other famous guests once stayed. One of the best ways to view the scenery of the wild Patagonia region, get a professional gaucho to show you around on horseback. The company El Relincho in El Chaltén plans trips for riders to venture out from their Estancia Bonanza through the De Las Vueltas river valley and beyond. Professional and knowledgeable guides will share stories about the area and history of the land. You’ll have views of Fitz Roy as you ride through native forests, do a few river crossings, and stop for a mate (a traditional hot, herbal Argentine drink) break. They offer transportation to and from town, but they also offer campgrounds at the ranch with hot showers, common areas, and a kitchen if you decide to stick around for a night or two. This beautiful hike of 11 miles (17 km) over three separate hills can be done in a day, taking roughly 3 to 4 hours each way. An alternative to the most popular treks in El Chaltén, you’ll notice that it’s much less crowded on the trails, but you’ll still have fabulous views of Fitz Roy, Cerro Torre, and Laguna Torre from a different, southerly point of view. Along the way you can spot condors, livestock, and rare slipper orchids. The path includes a steady incline, leafy forests, plains, viewpoints, and hills over the course of the day. Many visitors who’ve done all the big hikes in El Chaltén claim that this one actually offers the best views of the famous surrounding mountains. 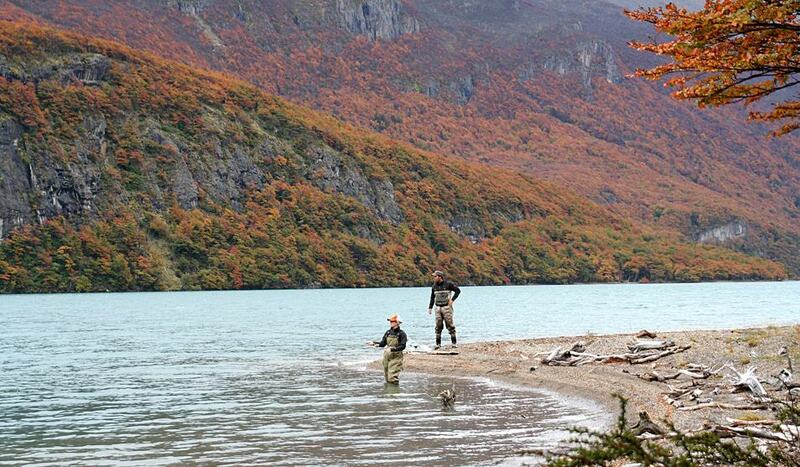 The Patagonia provides endless fly fishing options, and the waters around El Chaltén are no exception. Whether you find a fishing lodge to stay in, hire a guide for the day, or just purchase a license in town before heading out on your own, you should definitely try your hand at catching some local rainbow trout. Lago Desierto and Río De Las Vueltas are both good options for fishing just outside of town in the months from November to May. Gustavo Minotti is a well-known guide in the area and he can show your the best spots in the river valleys to find fish. Another beautiful but less frequently visited lake near town, the route you’ll drive from El Chaltén to Lago del Desierto is one of the prettiest in southern Patagonia. The trek to the Huemul Glacier begins here, but you can also take a boat out onto its blueish green waters – catamarans leave from the pier and journey across the lake, making trips that last about 45 minutes. Or you can arrange to mountain bike around the lake and back to town along those 23 miles (37 km) of scenic unpaved road with a tour company. There are campgrounds near the lake where you can set up tents for the night if haven’t gotten enough of the fabulous scenery here or you’re not ready to venture back to El Chaltén. Almost as necessary as a beer after a tough hike, getting a massage in El Chaltén will help your body recover after taking on Cerro Fitz Roy and Torre. The perfect cure for sore legs, Spa Yaten is the place to go in town for professional rejuvenation. They offer deep tissue massages, relaxation massages, jade massages, and even use of their shower rooms, saunas, and jacuzzis (complete with essential oils and mountain views). The spa staff can also do facials and cold therapy leg treatments. The value is great, and you can package together several of their services to get a better deal.